ToolCraft Premium Carpenter 158 BCG with Nickel Boron coated finish. BCG has the ToolCraft Logo and PA-15 engraved on to the side of the BCG. What's the difference between this Toolcraft NiB BCG and the PSA LOGOED PREMIUM 5.56 NICKEL BORON BCG - SKU 516446450? BEST ANSWER: I have both and they're identical besides the Logo. I own several Toolcraft BGC (.458 SOCOM, 7.62x39, 6.5 Grendel, 5.56) and this is the first time seeing their Logo etched on one. The bold is not toolcraft. The carrier is. How did you determine it's not a Toolcraft bolt? I bought a Toolcraft BCG from another vendor a while back and the bolts are marked identically with the MPI stamping on it. Of the eight BCGs I have, majority from PSA, have no markings on the bolt. How does the finish hold up? BEST ANSWER: As long as you clean it, it will always look like nickle Barron. I have been shooting with this bolt for two years and it still looks as it did when I installed it. Is this a full auto bcg? BEST ANSWER: Yes, has auto sear catch intact. so this means the internal surfaces of the gas key is NiB as well? BEST ANSWER: The gas key looks grey/white inside, but not shiny like the outside. Do these come from Toolcraft with the Nickel Boron plating or is the Nickel Boron added after they leave Toolcraft? BEST ANSWER: The TOOLCRAFT logo appears to be on the NiB finish, etched on the finish, along with "PA-15" on the bolt carrier only. I believe Toolcraft manufactures the carrier, contracts with another manufacturer to fabricate the bolts (to Toolcrafts specs), and has UTC to do the NiB plating. Is there any particular cleaners not to use on this finish, like Ballistol? BEST ANSWER: The only gun cleaners I suggest not using on NiB are heavy bore cleaners or copper solvent cleaners. As these type of products are very very strong and should only be used in the bore and chamber, and no where else on the gun. But any other CLP type cleaners/lubricants will not affect the NiB coating, ballistol included. Will this work with .300 blackout? BEST ANSWER: All 5.56 bolts will work with .300bko. ARE THE BOLT CARRIERS AND GAS KEYS CHROME LINED? BEST ANSWER: I don't think it is. Doesn't look like it. Is the bolt NiB finished too? Yes. The cam pin and the gas key, also. 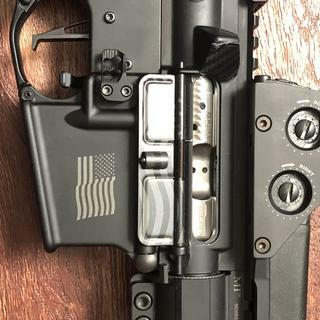 Is it illegal to have a full Auto BCG in a semi lower? completely legal to possess by any person. NO, most BCGs these days are Full Auto capable. It’s illegal to own or possess a full auto lower and/or trigger group. I run Full Auto BCG in all my ARs. This NB one is AMAZING! ****Full Auto Rated**** and the answer is, it’s probably a good idea to have an idea of what is illegal & isn’t other than asking the internet. But no, it’s not. Looking further, the short answer is that the only controlled part is the “auto seat”. All other parts are legal where AR 15s are legal. No. I means the bolt is designed to work with an auto sear. It can not change a semiauto rifle into a machine gun. No. Gun still functions as semi automatic fire arm only. This bcg does not affect that. no, it's not the bc g that makes fully automatic, it's the hammer and activator. Will this assembly work in a psa 10 upper? BEST ANSWER: Absolutely NOT!! You need the appropriate AR10 carrier and bolt in the caliber to match your barrel (308, 6.5 Creedmoor, etc.). Big size difference in AR15 and AR10 BCGs. This is a 5.56mm size. The psa 10 is 7.62x51mm. Think .223 vs. .308. Is the bolt an OEM or the bolt is made by TC and installed by them? what does PA-15 Engraving mean on the bolt carrier group ? Is this BCG entirely made in the USA? Great looking bcg, have not fired this yet. But I don’t see any issues. 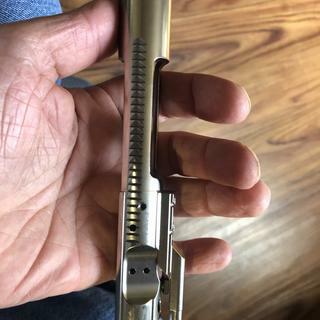 Being my first Nickel Boron BCG, I was thinking for the price that for some how I wouldn't be pleased with the overall quality. But I took the chance anyway. I was very impressed when it arrived. the look, feel and action cycles smooth, and clean up is not much more than a wipe of the rag. I bought Mothers mag & aluminum polish thinking it was going to be dull, it was not, it even came oiled. I am so glad that I made the purchase. Excellent BCG with amazing price! This was my first NiBor bcg, and I was very pleased with the overall quality, look, and feel. The action cycles smooth like butter, and clean up is not much more than a wipe of the rag. I will be picking up a few more of these for other builds. Love my Tool Craft BCG. Great bolt for the price. Bought this bolt wanting to upgrade from PSA's standard parkerized bolt. Oiled it up and dropped it in, and it easily runs twice as smooth as the standard. I have shot several hundred rounds through it and so far have had no issues. best is have see and almost any price point. if i could give 6 stars i would!!! this is a crazy good bolt. the finish is mirror like and and machining is very good and the edges feel Hey ben chamfered. I remember when I got out of the military in 2004 a bolt like this would cost about 250 to 300. I was quite surprised with the quality of this bcg, I did my research on it with others and I'm glad I made the decision to buy ,and at the price I could not say no, definitely would recommend to anyone who's looking for a quality bcg . With all the choices for premium bolts out there, what really matters is how it runs.. how it holds up.. a few companies make the majority of bolts for various companies, and toolcraft is one of the major OEM’s. I love this BCG.. quality fit and finish, great function, super easy cleanup .. and I didn’t have to pay 200 bucks or more for it .. I will definitely buy more of these in the future just to have in the parts inventory .. I would recommend this product. They work great. Good product/Good price. Fantastic deal on this BCG! Works flawlessly and cleans up really easily and well. Cant find a better group for the money. Plan to install these in all my builds. Well made and functions great. I ordered two. One had a defect. Contacted PSA by email to exchange it but no replies. We do apologize for that. We are showing that you were sent a response on 11/30/18 at 11:36am. Please contact Customer Service so we may resolve this issue. Great quality product and great price. Bought for my nephews for Christmas. Very satisfied. Works as good as it should so far. Only put 200 rounds through 10 in. .556 AR pistol. However, no problems. I have run over 1000 rounds on another NB Toolcraft, ordered from another supplier. Flawless and reliable. Can't complain, no issues and easy to keep clean. I'm happy I went with nickel boron. Excellent BCG for the price, flawless function. This BCG is a very good value, NCB finish is clean and evenly applied. Gas key seems properly staked and no malfunctions in the first 500 rounds fired. I would have given it 5 stars but I'm not a fan of the logo laser etched into the side. At first glance it looks like a blemish. Very well done , clean and shiny!! Good price $79.00!! Great product for the price. Very slick, good quality. I inadvertently ordered this part. I thought it was a .308 size BCG. I think this part is overpriced for a 5.56. I'm sure I will use it in some future build and might find it is worth the price. Three stars because of the price. My mistake. This has to be the Slickest Feeling BCG I own. Performs perfectly. I own a number of BCG’s w/ nickel boron coatings. No tool marks - very nice - do not hesitate to purchase. Seems PSA has improved on their ship time. Received in 2 Days. Nice very smooth !! will work good once broken in !! This BCG is a great Deal. The machining and finish is exceptional. I’ve run 400 plus rounds and no hiccups and the assembly wipes clean. I have several AR’s with upgraded DD assemblies and for half the price I see no difference. No signs of unusual wear this could me my go to unit. Staking very clean. You can just look at it and see the quality. Toolcraft makes alot of companies BCG's. I love the finish on this bolt. Looks amazing and very easy to clean. Highly recommend. Delivered on time. Took it to the range and it preformed flawlessly. If you're looking for an alternative to some of the name brands at a good price I would recommend it. Best BCG for the money! Exceptional! Best BCG for the price! Amazing quality! wish i had bought more maybe santa will come thru for me !!!!! This is a great bolt carrier group. No failures so far. I have two and the Toolcraft logo is significantly better on one than the other but other than that no complaints. Fit and finish is exceptional. Great BCG for the money. And if you treat it just right it can make you coffee on occasion. I will continue to purchase quality products from Palmetto. works as advertised. Can't ask for anything more. Quality product, as always, from Palmetto. Quality BCG at a great price! 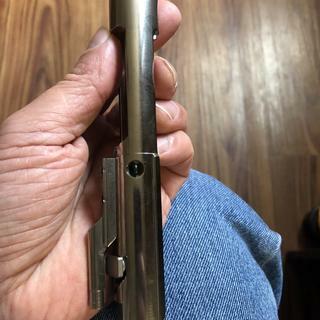 This bolt carrier is beautiful smooth as butter and easy to clean the staking is well done firing pin rolls true extraction sping is good bolt is good the quality is good. Noticable difference the way it cycles I shot 200 rounds with this bolt carrier and not one hiccup. One of the best upgrades ive ever purchase without breaking the bank and I will be buying another one for my next build. Bling bling. Zero issues so far with just over 1k rounds through it. I'll never buy anything other than Toolcraft again. The logod versions lifetime warranty seals the deal. Fantastic Price and it works! Works well in an Aero M4e1 upper with a faxon 18" Wylde chamber, and it cleans up easily. Will use in future builds. It’s a tool craft, is this actually a question? I answered a question regarding whether this was illegal to run on a semi auto lower. My answer should have been “seriously” FA is determined by a lower.... excellent product for either lower, lol. Great price and great product. It’s very easy to clean and cycles very smoothly with the NB coating. Fit and finish is comparable to any BCG I've seen. Works perfectly and easy to clean up. I'll be getting a couple more.